Summary : This is a great tea. Yeah, it is lacking the "punch" of many other teas. But this tea is suppose to be light...and it is. Yet, despite being light, the tea has a pleasant and non-bitter taste. Review : I guess I'm becoming use to the lighter tastes found in white tea. And this is a good thing, too. Reason? Simple...white tea generally uses only the highest quality of leaves. And in this tea from Adagio Teas, the superb quality of the leaves certainly show themselves. Straight out of the tin that this tea arrives in, a person can't but be impressed by the wickedly large size of these leaves. They sort of resemble large and wide twisted lawn clippings! They are just huge. And once brewed, the leaves are massive - and really do resemble lawn clippings (with a much better taste!). This is how Adagio Teas describes their White Assam Tea on their website : "Snowbud is comprised exclusively of unprocessed leaves and buds, all gathered and dried in the early days of spring. 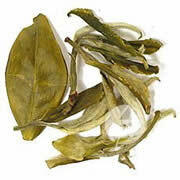 Of all the teas we offer, our 'Snowbud Finale' is the lightest one." After consuming my first cup of this tea, I'm still truthfully trying to figure out what I liked so much about it. You see, this tea doesn't have a strong flavor. Light is most definitely the way to describe it. Perhaps I liked this tea so much due to its lack of any bitter flavors. This tea, at least to me, defines the word smooth. Nothing harsh. Nothing bitter. Nothing sour. Just smooth! And yet, although the tea lacks a strong flavor, the light flavor of this tea is very pleasant. Especially taken in the evening when you want to calm down, but yet don't want to fall asleep (something a chamomile tea will do to you). Overall, for anyone who enjoys light tasting teas, you'll be hard pressed to not enjoy this one. The taste is just smooth. Almost pure, in fact. And perhaps that is what I enjoy about this tea so much - it's about as pure of a tea from high quality leaves that you are going to find. Recommendation : Yes. This tea isn't for "flavor hunters", admittedly. Instead, it is for those seeking out a light-tasting and non-bitter tea. This tea simply "slides down," with no work, awkward faces or puckered lips. The leaves are high-quality and the after-taste is almost non-existent. This tea really does make for a nice "calm-down" tea. Brewing Instructions : Use 1 teaspoon of leaves, although you'll need to use more due to the large size of the leaves. Pour water with a temperature of 180 degrees over leaves and let brew for 7 minutes.